Today the weather changed again. I purposefully took Friday and Saturday off to get things done so I could start this week with today. 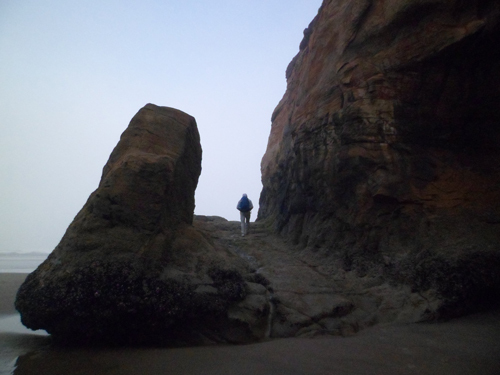 The tides were below zero feet, otherwise known as a minus tide and the weather forecast called for sun so perfect conditions for painting at Hug Point. Lowest tide was at 10:35 am so I headed out the door at 8, along with my mate, to have plenty of time to paint before the tide turned. Alas, as often happens in this area, coastal fog has set in. I still went to paint as you can see from the picture above. It was cold though. This is a one hour study and I was shivering by the end of it in spite of my layers. I decided we should go back home even though I had planned to do another one hour study. 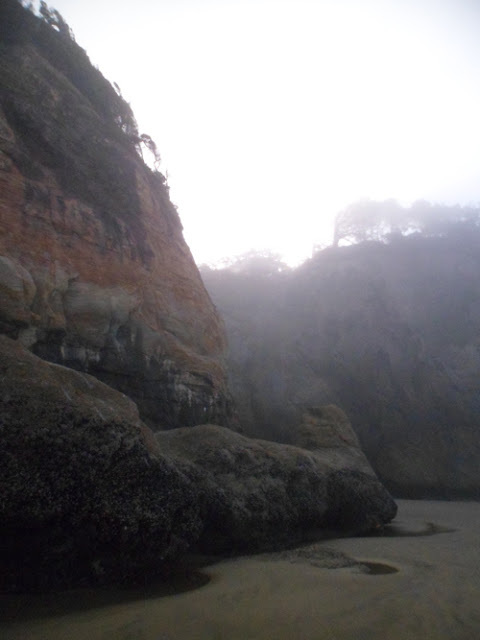 I have written about Hug Point before. It is a magical place but can be tricky. 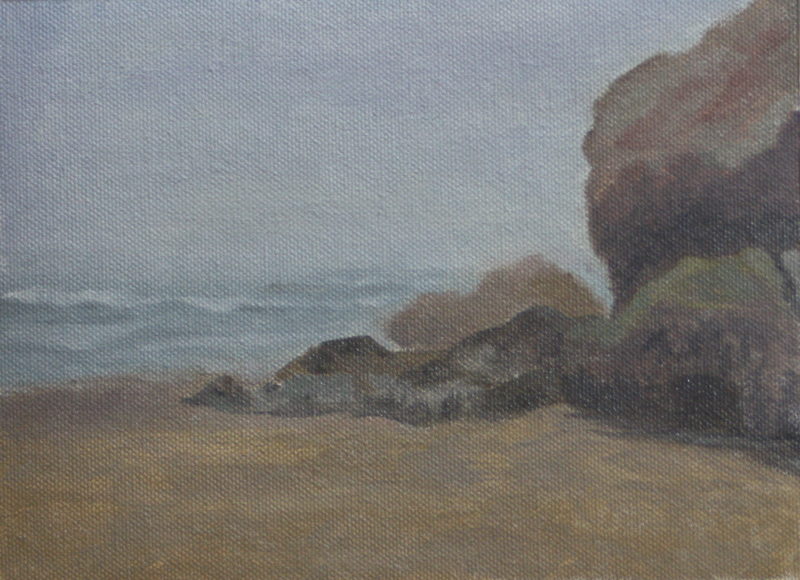 The last time I went the tide and surf were too high to paint this scene of the old road bed over the ocean. That is what this painting is, a portion of the view of the old road bed that used to be the only way to get a vehicle or horse down the coast. It was dangerous then as well and you had to time it right to cross before the tide came up. Certain times of the year it became impassible. At least, that is what I have read. 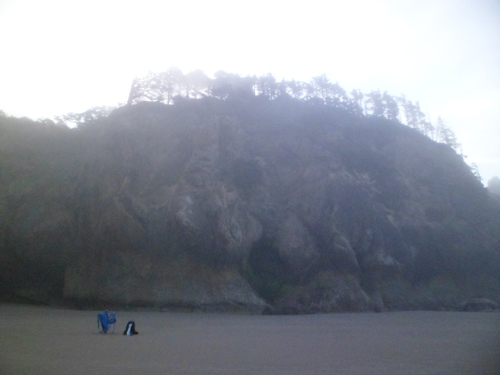 Hug Point. Road bed along lower left of the cliff. The cliffs on right side of this picture are riddled with caves which is how far back the waves go when the tide is high. Hug Point roadbed from beach looking Southeast. 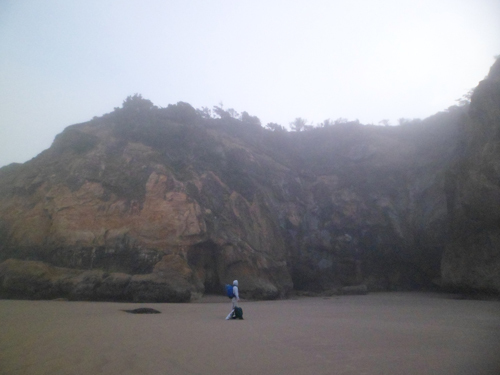 I will be painting at Hug Point again. Going there is bewildering because there is so much to paint. I could easily spend years, and hopefully will, painting there. The waves were quite puny today. One of the drawbacks to painting at such a low tide. The fog obscured what little there were. This isn't too much of a problem since the surrounding scenery on the Northern Oregon coast is nothing less than stunning even on a bad day. 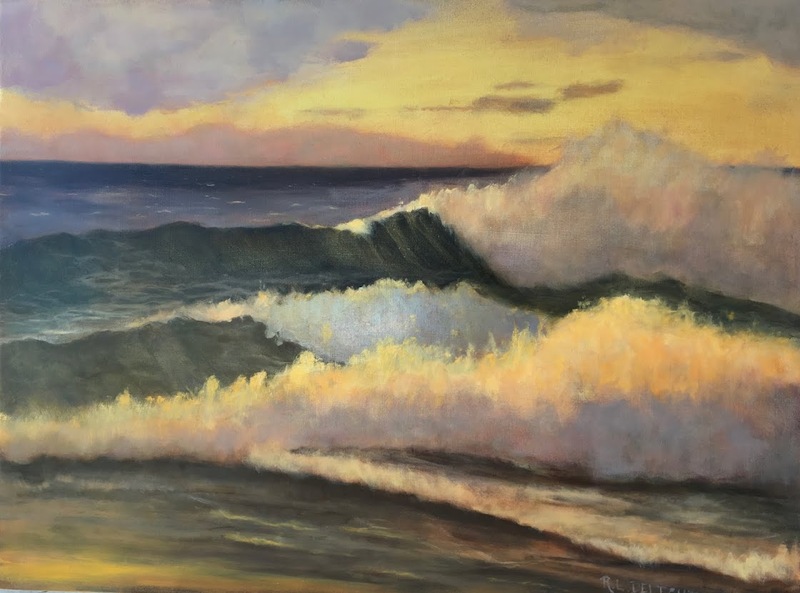 I haven't decided where to paint tomorrow but will probably get some wave studies in. * I was reading The International Bank of Bob by Bob Harris. Highly recommend it, specially if you participate in making Kiva loans or are curious about it. It can get a bit gritty in some spots but leaves you with hope and faith in the world. Skimpy waves or not, that is beautiful spot. What an interesting place. Not sure how my horses would feel riding over that let alone how I would feel about it. Seems a dumb question but how slippery is it? Not a dumb question at all Theresa. It is a bit slimy and there are sea critters all over it as the waves reach up to about four feet up the cliff wall. People and their dogs cross it and several did that morning. Personally I have never crossed all the way over. It don't like stepping and crushing the creatures, and it is slippery.